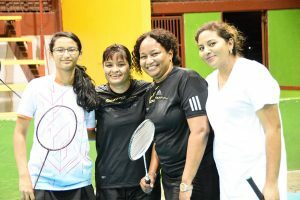 The GUMDAC Annual Open Doubles Badminton tournament opened on Friday last at the National Gymnasium. The tournament is running for the fifth year and is sponsored by Mr. Darrell Carpenay, Managing Director of GUMDAC. The Events being played are Open Men & Ladies Doubles and Mixed Doubles. This tournament opens the first Guyana Badminton Association (GBA) Local Event for the Year 2018. Open Top Players Jonathan Mangra & Ronald Chang Yuen defeated the Under-13 Champions Matthew Beharry & Vikash Mootoo: 21-8, 21-8. These two brave young players were fareless playing against the Seniors. The Tournament continued yesterday with play-offs in the Men Doubles Finals & Third Place and the Mixed Doubles Events. The presentation will be done at the end of all the remaining finals.